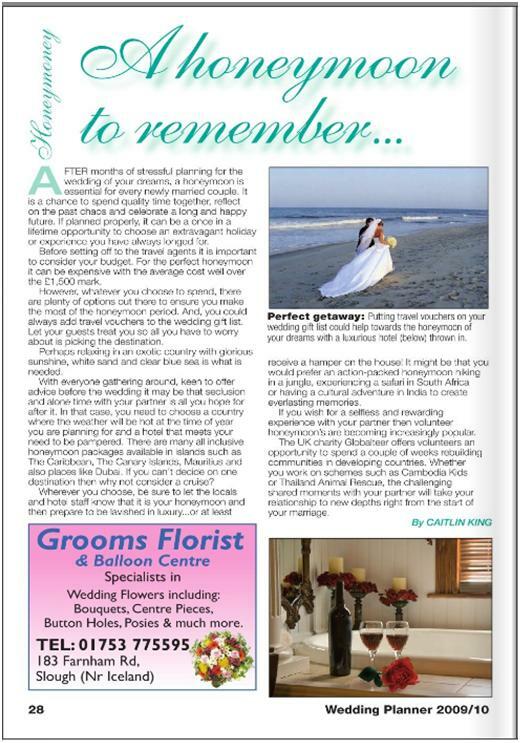 Whilst working at Reading Chronicle last summer I had the following feature published in their annual Wedding Planner magazine. After months of stressful planning for the wedding of your dreams, a honeymoon is essential for every newly married couple. It is a chance to spend quality time together and reflect on the past chaos and celebrate a long and happy future. If planned properly it can be a once in a lifetime opportunity to choose an extravagant holiday or experience you have always longed for. Before setting off to the travel agents it is important to consider your budget. Yes, for the perfect honeymoon it can be expensive with the average cost now well over the £1500 mark. However, whatever you choose to spend, there are plenty of options out there to ensure you make the most of the honeymoon period. And, you could always add travel vouchers to the wedding gift list, that way your guests can treat you and all that’s left for you to worry about is the destination. Perhaps relaxing in an exotic country with glorious sun, white sand and clear blue sea is what is needed. With everyone gathering around, keen to offer advice and help you plan wedding it may be that seclusion and alone time with your partner is all you hope for. You need to choose a country where the weather will be hot at the time of year you are planning for and a hotel that meets your need to be pampered. There are many all inclusive honeymoon packages available in islands such as The Caribbean, The Canary Islands, Mauritius or places like Dubai. If you can’t decide on one destination then why not consider a cruise? Wherever you choose, be sure to let the locals and hotel staff know that it is your honeymoon and then prepared to be lavished in luxury…or at least receive a hamper on the house! It might be that you would prefer an action packed honeymoon hiking in a jungle, experiencing a safari in South Africa or having a cultural adventure in India to create everlasting memories. If you wish for a selfless and rewarding experience with your partner then volunteer honeymoon’s are becoming increasingly popular. The UK charity Globalteer offer volunteers an opportunity to spend a couple of weeks rebuilding communities in developing countries. Whether you work on schemes with Cambodia Kids or Thailand Animal Rescue, the challenging shared moments with your partner will take your relationship to new depths right from the start of your marriage. 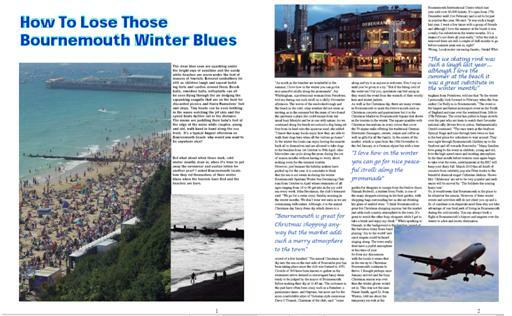 This is a feature about Bournemouth that I wrote for an assignment in January 2010. The clear blue seas are sparkling under the bright rays of sunshine and the sandy white beaches are warm under the feet of masses of tourists. Bronzed sunbathers lie still as children laugh and squeal building forts and castles around them. Beach balls, rounders balls, volleyballs can all be seen flying through the air being dodged by the squawking seagulls that are on the hunt for discarded picnics and Harry Ramsdens’ fish and chips. Tiny heads can be seen bobbing in the waves watching the jet skis and the speed boats further out in the distance. The mums are paddling their baby’s feet at the edge of the water while couples, young and old, walk hand in hand along the sea front. It’s a typical August afternoon on Bournemouth beach- why would you want to be anywhere else? But what about when those dark, cold winter months draw in, when it’s time to put away the swimwear and suntan lotion for another year? I asked Bournemouth locals how they rid themselves of their winter blues when the tourists have fled and the beaches are bare. “As much as the beaches are wonderful in the summer, I love how in the winter you can go for nice peaceful strolls along the promenade”, Joy Whittingham, a professional woman from Moordown, told me during one such stroll on a chilly November afternoon. The waves of the sea looked rough and the beach in the cold, crisp weather did not seem as inviting as in the summer but Joy found the quietness a place she could escape from her usual busy lifestyle and be at one with nature. As we continued along the beach we noticed a dog being set free from its lead onto the spacious sand, she added: “I know that many locals enjoy how they are able to walk their dogs here when all the visitors go home”. In the winter the locals can enjoy having the seaside back all to themselves and are allowed to take dogs to the beaches from 1st October to 30th April. Also bike riders can cycle along the prom during the out of season months without having to worry about making room for the summer tourists. However, just because the holiday makers have packed up for the year, it is a mistake to think that the sea is not swum in during the winter. Bournemouth Spartans Winter Sea Swimming Club runs from October to April where swimmers of all ages ranging from 10 to 90 get into in the icy cold sea every week. John Brookman, the club’s treasurer said: “We go for a swim every Sunday morning in the winter months. We don’t wear wet suits as we are communing with nature. Although, it is the annual Christmas day fancy dress dip which draws in a crowd of a few hundred.’ The annual Christmas day dip into the sea on the east side of Boscombe pier has been taking place since the club was formed in 1951. Crowds of 300 have been known to gather as the swimmers arrive dressed in extravagant fancy dress ready to be judged by the mayor of Bournemouth before making their dip at 11.45 am. The costumes in the past have often been crazy such as a Reindeer, a pantomime dame, and Neptune, but most opt for the more comfortable attire of Victorian style swimwear. Dave O’Donnel, Chairman of the club, said: “come along and try it as anyone is welcome. Don’t say no until you’ve given it a try.” But if the biting cold of the water isn’t for you, spectators can feel smug as they watch the event from the warmth of their woolly hats and winter jackets. As well as the Christmas dip, there are many events in Bournemouth to mark the festive month such as Christmas concerts and pantomimes but it is the Christmas Market in Bournemouth Square that draws in the tourists in the winter. The square sparkles with Christmas decorations in every colour that cover the 50 alpine stalls offering the traditional German Bratwurst (Sausages), sweets, crepes and coffee as well as gifts for all the family. In the centre of the market, which is open from the 19th November to the 3rd January, is a German alpine bar with a beer garden for shoppers to escape from the festive chaos. Hannah Bedwell, a student from Poole, is one of the many shoppers relaxing in the beer garden, with shopping bags surrounding her as she sat drinking her glass of mulled wine. “I think Bournemouth is great for Christmas shopping anyway but the market just adds such a merry atmosphere to the town. It’s great to watch the other busy shoppers while I get to take a break and enjoy my drink.” While speaking to Hannah, in the background is the familiar ‘sound of the Salvation Army brass band playing ‘Joy to the world’ and carol singers could be heard singing along. The town really does have a joyful atmosphere at this time of year. So from my discussions with the locals it seems that in the run up to Christmas Bournemouth continues to thrive. I thought perhaps once January arrived and the busy Christmas season was over then the winter gloom would set in. This was not the case. Fraser Smith, aged 22, from Winton, told me about the temporary ice rink at the Bournemouth International Centre which last year sold over 60,000 tickets. It’s open from 17th December until 21st February and is set to be just as popular this year. He said: “it was such a laugh last year, I went a few times with a group of friends and although I love the summer at the beach it was a really fun substitute in the winter months. It’s a shame it’s not there all year really.” After the rink is removed there are still a couple of dull months to go before summer peak sets in, right? Wrong. Local motor car racing fanatic, Gerald Whittingham from Moordown, told me that “In the winter I personally look forward to February when the Sunseeker Car Rally is in Bournemouth.” The event is the largest and fastest motorsport event in the South of England and runs over the weekend from 26th to 27th February. The event has pulled in large crowds over the past who are keen to watch their favourite national rally drivers live in action. Enthusiastically Gerald continued: “The race starts at the Seafront Special Stage and runs through here twice so that is the best place for onlookers to wait around. They race right through Bournemouth Gardens up to the Seafront and off towards Boscombe.” Many families love going to the event as children, young and old, love the high speed races and exciting atmosphere. In the final month before tourists once again begin to take over the town, entertainment at the BIC will keep your diary full. March 2010 has all kinds of concerts from celebrity pop star Peter Andre to the beautiful classical singer Catherine Jenkins. Shows like ‘Oklahoma’ are set to be very popular and audiences will be moved by ‘The Soldiers-the coming home tour’. So, it would seem that Bournemouth is the place to be whatever the season. However, if these winter events and activities still do not cheer you up and a fix of sunshine is in desperate need then why not take advantage of one final perk of living in Bournemouth during the cold months. You can always book a flight at Bournemouth’s Airport and migrate over the winter to a hot and exotic destination.